The traditional Indian method of learning Sanskrit is through oral transmission, memorizing texts first and then learning the meaning. The western academic approach methodically teaches the alphabet, declensions, grammar, syntax, and vocabulary building. 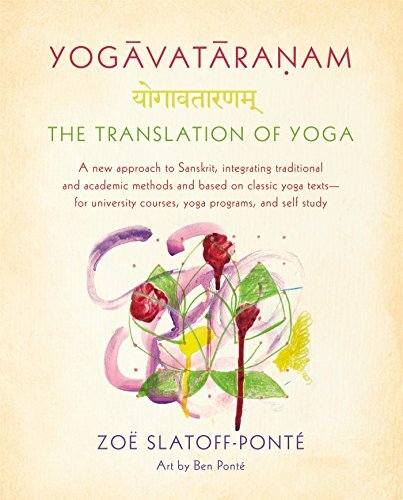 Yogāvatāraṇam, a new Sanskrit textbook, integrates the traditional and academic approaches for a full and practical study experience. Yogāvatāraṇam approaches language systematically while at the same time allowing students to read important and relevant texts as soon as possible, while emphasizing proper pronunciation through its audio accompaniment (see below). The first section teaches reading and basic grammar. The second covers more extensive grammar. By the third section the student can begin to read and understand even more complex texts such as the Upaniṣads. Introduction to the Audio Accompaniment: We begin with an invocation to Gaṇeśa, the remover of obstacles, and a chant to the guru to help open our eyes (and our ears)! In Part I, the audio files begin with the Sanskrit alphabet and contain the grammatical conjugations and declensions as well as all the examples and exercises from this section. In Parts II and III, only the examples and exercises are given. The Vedic chants are done with the Vedic pitch accents, as the proper pronunciation and exact cadence is essential. All other chants are done in melodies I have learned from my teachers in India. You may know some of these chants with slightly different tunes, and while pronunciation is still important, the intent is more important than the particular intonation for these chants. Try to listen to the audio as much as possible as you go through the book and recite along with the chants. The bonus tracks at the end of Part III are songs I recorded years ago with Anne H. Pollack when I was studying Hindustani and Carnatic classical music. The first is a chant to Gaṇeśa; the second is a song in Kannada to Lord Śiva, considered the first yogi and god of the yogis, explaining that you must have faith if you want him to respond.